Since Carter was born, Jason and I have been really lucky to have family around to offer to watch him while we continue to have regular date nights. I have read so many places where this is so important in a marriage with kids, especially as new parents, so one of my goals was to make sure this happened. Last night, we had a really fun night trying new places downtown. I thought this would help make one of our first date nights after Carter extra special since we’re really familiar with most of what downtown Raleigh has to offer. 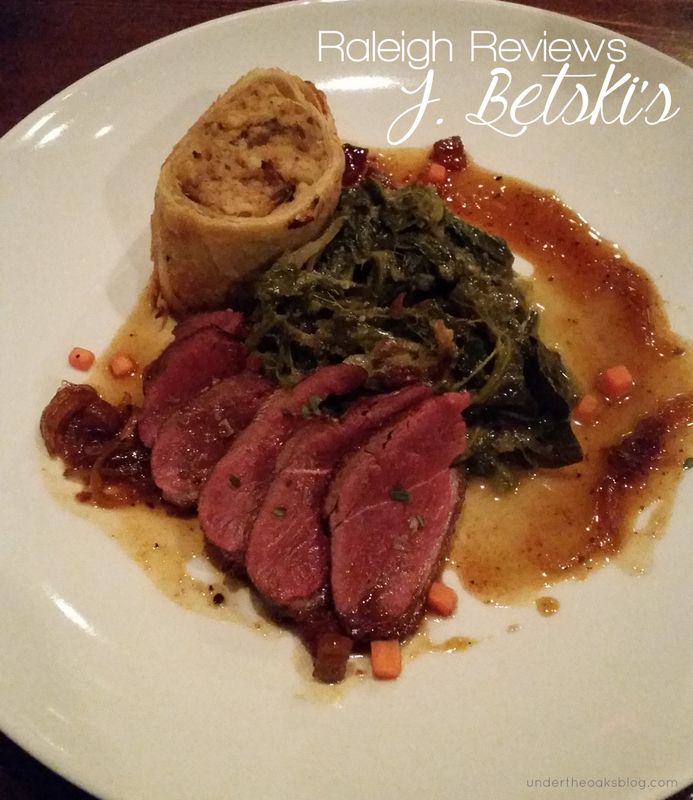 Last Saturday night, the girls and I went to one of the established Downtown Raleigh restaurants that I hadn’t been to yet, J. Betski’s. There aren’t too many of those so I was really excited to finally eat here. When I arrived, the girls had already cracked open a bottle of red and ordered some appetizers. Among the samples were Mushroom and Cabbage Pierogies with Sage Brown Butter, Duck Pierogies that I assume were a special, and Smoked Beef and Pork Kielbasa with Sauerkraut and Spicy Mustard. We dug in so fast that I didn’t get a chance to get any pictures! I tried the Duck Pierogies and Kielbasa and both were packed with so much flavor. If that was all I had for dinner, I would have been satisfied but I’m glad I didn’t stop there.